Uttar Pradesh Basic Education Board or Uttar Pradesh Basic Shiksha Parishad invited online applications for the posts of Assistant Teacher to fill up 12460 vacant posts. Eligible candidates for teaching jobs can apply online for UP Basic Education Board Asst Teacher job on or before 9 January 2017. Uttar Pradesh Basic Education Board or Uttar Pradesh Basic Shiksha Parishad invited online applications for recruitment to the posts of Assistant Teacher to fill up 12460 vacant posts. The eligible and interested candidates for teaching jobs can apply online for UP Basic Education Board Asst Teacher job along with required documents on or before 9 January 2017. Eligibility Criteria for UP Basic Education Board Asst Teacher Jobs: The candidate must hold a Graduate degree and must have completed BTC Diploma. The selection of the candidates for UP Basic Education Teacher Recruitment 2016 will be done on the basis of examination / interview which would be conducted by the organization. 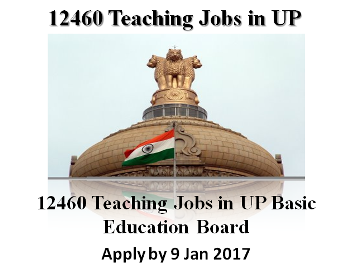 Eligible candidates can apply online to UP Basic Education Board Teaching Jobs for Assistant Teacher job along with other necessary documents on or before 9 January 2017.